The best approach is to have one dermaroller with short needles (0.20 or 0.25) for skin care product penetration that can be used up to 3 times a week on the same skin area and one dermaroller with long needles (preferably 1.5 mm) to induce collagen production in the dermis, which can be used once a month on the same skin area. “Smokers' lines” above the mouth are difficult to improve and it usually needs targeted needling with the single needle that we sell. Our current single needles have a 1.8 mm long tip and they stop automatically at that depth. You don’t have to go that deep. Unfortunately area above the lip is just about the most painful to needle so you will likely need EMLA. Make many pricks into the wrinkle with the single needle. Prick at various depths and from different angles. Prick the edges of the wrinkle a well. You'll likely get some pinpoint bleeding Don’t be put off by the initial pain, the first pricks are the most painful. It will be red for couple of days, depending how deep you needle so do not needle too many wrinkles at the same time if you don’t want people to notice you have done some wrinkle treatment. Repeat this procedure every six weeks until the wrinkles improve. Prick individual brown spots with the single needle. You don’t have to go very deep - I do not think you need EMLA for that. That should remodel them. Immediately after pricking, apply Retin A with a toothpick to the spot, provided the skin can handle it (if it burns too much, apply later). I do not recommend using acids (Retin A) immediately after dermarolling but in case of hyperpigmentation I think it's a good idea to use Retin A. First do a test patch on one spot only. For the rest, use a 0.20 or 0.25 mm dermaroller for skin products penetration (skin products of your choice) and use the 1.5 mm roller on your whole face (except the upper eyelids and the soft area just below the eyes). When you put your finger under your eye, you feel a bone. Do not roll closer to your eye than where that bone is. Pull/stretch your skin downwards from the eye with your other hand and roll it with the other. Do not push hard around the eyes with 1.5 mm needles. The skin is thin there. Concerning the lifetime of the dermaroller: It depends how often you roll, how tough your skin is and the size of the rolled areas. It is as difficult to answer as answering the question – how long will a knife remain sharp. It depends on how often you roll and how much skin you roll, etc. You can soften your skin before dermarolling by taking a hot bath or long shower. It will make the skin easier to penetrate for the needles. It should make the rolling easier and the needles will remain sharp longer. We do not sell any acids currently. We might in the future. Salycilic acid loosens and breaks down the outer layer of skin. It penetrates the skin pores and helps to keep them unblocked which makes it very popular for acne treatment. Make a mixture of sugar + oil or salt + oil and scrub your body in the shower. It will nicely exfoliate your skin. Coconut oil (it is actually solid at a room temperature) – use on dry skin or hair ends. Coconut oil easily penetrates hair. Massage it into the hair ends for half an hour before you wash your hair. If your ends are extra dry, massage a little into them and do not wash it off. You can also use it for frying (do not use very high temperatures). It is cholesterol-free. Store it cool. Almond oil – penetrates deep into the skin. Take a cotton pad, make it slightly wet with tap water, pour a little bit of almond oil on it and clean your face with it. It’s a very soothing and non-irritating cleanser. You can also use a little elsewhere on your skin. Store the main bottle in the fridge and refill a small container in the bathroom to ensure it's always fresh. Panthenol spray or cream - use on your skin and as a hair mask. It moisturizes the hair without making it greasy. If the skin on your legs is dry, use body milk containing urea since it is a strong hydrating agent. Dermarolling / Microneedling / How to treat dermal melasma? >What can you recommend, if anything, for dermal melesma? >I worry about creating added inflamation and yet I need greater penetration for my skin care products. Melasma is one of the most difficult skin conditions to treat. It is caused by hyperactive melanocytes (pigment producing cells) resulting in the overproduction of melanin pigment. The origin of this hyperactivity is not fully understood, it’s believed to be a combination of genetics, hormones (estrogen) and sun exposure. High estrogen levels (due to hormonal contraception or pregnancy) usually triggers or aggravate this condition. Currently, doctors don’t know how to stop the overactivity of melanocytes. Thus they cannot treat the cause, only the symptoms. Nevertheless, acid peels ( for examle Jessner's solution) can help. Melasma is frequently present in both the epidermis and the dermis ( Wood`s lamp can determine the depth of the pigment) so acid peels have only a limited effect. Old melanocytes will be replaced by new ones that are again over-active. Sometimes repeated stimulation induced by acid peels of the new melanocytes makes the melasma even worse - although this is highly individual. Tyrosinase inhibitors such as hydroquinone is currently the best treatment for melasma. They inhibit the enzyme that converts tyrosine to melanin. It occurred very rarely but in some individuals prolonged or/and excessive use of a high percentage hydroquinone (above 3% for 6 months) in combination with extensive sun exposure caused exogenous ochronosis – bluish black pigmentation. Tretinoin (Retinoic acid) usually improves melasma by increasing the turnover rate of new skin. Avoid exposure to sunlight as much as you can and use high factor sun blocks, preferably with zinc oxide or titanium dioxide (they block the entire UV spectrum). The downside is that they are reflectively white and will make your face whitish. Nowadays though, you can buy a sun block with nanoparticles of zinc oxide (micronised zinc oxide). This sun block is not white but transparent. There were some concerns about the safety of zinc nanoparticles since they, contrary to ordinary zinc oxide, could potentially penetrate deeply but after some studies showed it also stays on the surface, micronized zinc oxide was approved and it is considered safe. Alternatively you can add skin tone makeup to your zinc oxide sun block cream to make it less white. If you wish to stay in the sun for a long time and do not care how you look, buy a baby diper rash cream containing a high percentage of zinc oxide and totally cover the melasma with it. That will make your skin very white but it will totally or almost totally block the sun. Zinc dries up the skin so first apply some moisturizing cream and after that the zinc cream. If you use hormonal contraception, consult your dermatologist and gynecologist whether it would be suitable to switch to non-hormonal contraception such as IUD, due to your melasma condition. Melasma creams typically contain a combination of a tyrosinase inhibitor, acid peels, tretinoin, sunscreen and sometimes a corticosteroid - which is an anti-inflammatory. A dermaroller for skin care product penetration (0.2 mm needles) should not cause any skin inflammation. If it does in your case, then use even shorter needles. There might be some short-lasting redness (just as it happens when you rub the skin) but that should disappear very quickly. Dermal Melasma is in the dermis part of the skin and that is very deep. Anything acting superficially is not going to work. You have to get the products deep. You can use a 0.2 mm dermaroller to enhance the penetration of hydroquinone to the dermis but do not do it for a prolonged time. The best protocol is 3 month on, 1 month off. You can use other skin lightening products with dermarolling. Vit. C is a powerful antioxidant and in concentrations above 5 %, it acts as mild skin whitener. However, it can irritate the skin. Apply tretinoin (Retin-A) once or twice a week on your melasma after dermarolling. Do it in in the evening because Tretinoin is light sensitive. If your skin becomes too irritated, apply it without rolling and less frequently.Be warned however that in some people this actually makes the melasma worse, because melanocyte activity can be increased by the skin stimulation from the tretinoin. This seems to be a genetic factor and unless you try it once, you won't know whether it applies to you. The same applies to laser treatment in melasma. Always do a small test patch first. Lightening agents can't affect the existing pigment, it can only reduce the formation of new pigment. That is why it sometimes takes months to see effects. Ablative procedures (such as microdermabrasion, acid peels etc) remove existing pigment but they cannot prevent the formation of a new one. They cannot go very deep due to danger of scarring and hypopigmentation. Dermarolling is not an ablative procedures (a dermaroller does not remove skin layers, it only make temporary microinjuries in the skin). Since dermarollers speed up the skin's turnover it should improve Melasma by speeding up the sloughing off of skin including the pigmented skin. A short-needled dermaroller is useful for Melasma in the epidermis. A long-needled dermaroller could be an interesting option for dermal Melasma. The turnover of the epidermis is much quicker than the turnover of the dermis and ablative methods can't easily reach the depth of the dermis due to the risk of scar formation, so a dermaroller that can reach the dermis (> 0.5 mm) could be theoretically very useful for deep Melasma. However I'm not very keen on recommending it for Melasma because it causes short-term inflammation and it is likely that Melasma will reoccur and dermarolling will have to be repeated over and over for maintenance. If you decide to try it, do a test patch first. Because inflammation seems to play a certain causative role in melasma and dermarolling might make it worse, I would be cautious using long needles (longer than 0.2 mm) due to the fact that they induce inflammation. There is not enough data available yet to make an informed judgment about using long needles on melasma. The problem with long lasting hyperpigmentation in Melasma, café-au-lait spots and other melanin related pigmentation is that the root cause of the pigmentation is unknown. It is caused by local overproduction of skin pigment melanin by pigment producing cells (melanocytes) but nobody knows why melanocytes produce an excessive amount of melanin in certain individuals. Thus, you cannot treat the cause but only the symptoms. That is why fighting hyperpigmentation is so difficult. You will manage to lighten your spot with melanin inhibitors, however it is likely that your melanocytes will keep on producing excessive amounts of melanocytes in that area. The reoccurrence of the hyperpigmentation does not always happen, however it is not uncommon. There is a new skin lightening topical called Elure that works in a different way than hydroquinone. Elure contains an enzyme ( lignin peroxidase) that breaks down existing pigment. Hydroquinone prevents formation of a new pigment. The results with Elure were disappointing in many cases and successful in a few. I don't want to comment on its efficacy because I truly can't say anything else about it except that it's extremely expensive. When you use a sunscreen (I hope you do), use one that has only physical blockers and no chemical blockers. Physical ones reflect UV whereas chemical ones absorb UV and convert it to heat, which can make melasma and other pigmentation worse. Pharmacies often sell a sunscreen with physical filters for people who are allergic to chemical filters. 3-step Proactive cleanser and lotion contains Benzoyl peroxide which is good against acne but should not be applied on rolled skin. You should wait at least two days. Water, Glycerin, Isohexadecane, Niacinamide (Vitamin B3), Isopropyl Isostearate, Aluminum Starch Octenylsuccinate, Nylon-12, Dimethicone, Tocopheryl Acetate (Vitamin E), Panthenol (Pro-Vitamin B5), Sodium Hyaluronate, Palmitoyl Pentapeptide-4 (Amino-Peptide), Carnosine (Amino-Peptide), Camellia Sinensis Leaf Extract (Green Tea), Aloe Barbadensis Leaf (Aloe Vera), Soluble Collagen, Elastin, Allantoin, Stearyl Alcohol, Polyethylene, Cetyl Alcohol, Sodium Acrylates Copolymer, Behenyl Alcohol, Benzyl Alcohol, Caprylic/Capric Triglyceride, Polyacrylamide, Dimethiconol, PEG-100 Stearate, Stearic Acid, Disodium EDTA, Cetearyl Glucoside, Cetearyl Alcohol, Citric Acid, C12-13 Pareth-3, Laureth-7, C13-14 Isoparaffin, Sodium Hydroxide, Ammonium Polyacrylate, Phenoxyethanol, Sorbic Acid, Butylparaben, Ethylparaben, Isobutylparaben, Methylparaben, Propylparaben, Sodium Benzoate, Mica, Tin Oxide, Titanium Dioxide, Fragrance. Some of the ingredients are anti-inflammatory. A mild controlled inflammation is desirable after dermarolling because it triggers collagen production. The quantity of those anti-inflammatory ingredients it in the cream is likely so low that it is not going to suppress inflammation. Abbey, unfortunately I must disappoint you, the upper eyelids is the only area where needles cannot be used due to the high risk of damaging the eye. There exist a risky method of pulling up the eyelids but if you are not an expert, this is not advisable and I can't therefore go into details about this here since I don't recommend it. The skin on the eyelids is the thinnest on the whole body. The entire eyesocket cavity is taboo for needles. A dermaroller or a single needle can be used only where the bone around the eye starts. I advise you to find a skilled permanent makeup artist who performs eyeliners. They know exactly how deep they can go and they use special equipment. Ask them to go over your scar without pigment to soften it. This treatment should be repeated a few times and then may very well improve the teint of the scar to blend in better with the surrounding skin. Eventually they can maybe even use a skin color pigment to conceal the whiteness but the problem with scar camouflage is that the pigment often turns grayish or another undesirable shade with time or the tone is not exactly the same as your skin and that makes it very visible (it is difficult to mix exactly the skin tone of a person). It is more or less impossible to remove permanent make up (especially from an eyelid) so it would have to be someone with long-term skills in that field if pigment is to be applied. The face: 0.2 mm for skin care product penetration used up to 4 times a week + a 1.5 mm roller to induce collagen production used only once in three weeks on the same skin area. Décolletage and hands - you can try the same combination of the rollers. It depends how thick your skin is and how shallow the veins on the back of your hands are. Some pinpoint bleeding is OK. It is a sign that you've reached the dermis. If the pinpoint bleeding is too much, use shorter needles or reduce the pressure on the roller. Dermarolling / Microneedling / What to order? According to our recommendations (in our instructions for dermarolling), it's once every 2- 3 weeks for a 1 mm dermaroller. Once a month is also OK.
You can roll your entire face (if there are spots all over) - except your eyelids. Glabellar wrinkles need targeted needling with our custom made, very thin but strong single needles that we sell. Needling the wrinkle should trigger new collagen, thicken the dermis and epidermis. That should slowly fill in (at least partially) the wrinkle form inside. Needling will also improve the wrinkle by releasing the fibrous anchoring of the dermis to the subcutaneous tissue. This procedure called "vertical subcision" is sometimes performed to improve the dimpling of acne scars. You basically cut the connection between the underside of the wrinkled skin to lower layers, making the wrinkle raise up a bit. Of course, you can't expect wrinkles to totally disappear - they merely can be made less prominent. If you manage to get the production of new collagen going, this collagen will be there to stay - contrary to injectable fillers which are slowly eliminated by our body). Needling is not going to stop aging of course and your skin will continue to age but you can reduce the severity of the wrinkles. Unfortunately, needling cannot affect the fat in the hypodermis. Make many pricks into the wrinkle (while stretching the skin with your other hand). Try to prick from different angles and different depths. Prick the wrinkle's bottom, its walls and its edges. Do not prick deeper than pinpoint bleeding. If you do not want others to notice you've been wrinkle-needling then prick only one of your "11" lines at a time because they may get quite red and one red line will look less conspicuous than two lines. When the redness has abated, prick the other one. If you have the weekends off, the best time to needle the face is on Friday evening, so that the redness will be gone by Monday morning (it depends how deep and densely you needled). If the area is still a bit red on Monday, camouflage it with makeup. If the muscles in that area are more or less permanently in the frown position, use scotch tape or some other type of self-adhesive tape. Stretch the skin into the unfrown position and tape it over to prevent it going back into frowning. If you do this frequently, it will "teach" your muscles not to be in the frowning state. Do not needle shortly after Botox injections - wait at least two weeks. Please refer to my article on what can be done against Cellulite. Dermarolling / Microneedling / It works, and gets easier with practice! Thank you very much, I am really delighted that your scars are improving! Broken vessels are permanently dilated small blood vessels just below the skin surface. You can try to make pricks over the whole length of one of your broken capillaries with a single needle. It might cause the destruction of the dilated capillary and it will be absorbed. Prick only one first and wait and see what happens before you do the others. Certainly give vit. K creams a try. Use them long-term. If that doesn't help you could consider vascular laser treatment or an old fashioned but still effective electrocautery. Avoid big temperature changes (sauna etc.) and if you feel that the brushing (it temporarily brings blood to the surface) makes it worse, stop dry brushing. To distinguish broken blood vessels (vascular problem) from nonvascular red pigmentation spots, do a color change test. Apply pressure with your finger or a small object to the area. Since the pressure will prevent the blood flow, the broken vessels will stay blood free and thus becomes pale for a few seconds when you remove the pressure. Then the blood flows in again and the area reddens again. Skin spots are not deep in the skin, so a 1 mm roller is very good. Make a homemade vit. C serum according our instructions and use it several times a week. Cellulite is unfortunately a natural pattern of fat storage underneath the female skin in certain parts of the anatomy - it's not unhealthy but merely unsightly. Cellulite occurs in the subcutaneous layer of the skin, which mainly consists of fat. A dermaroller cannot affect that fat layer. It can only affect the epidermis and dermis above it. The cellulite might look slightly better after thickening the skin with a dermaroller and thus making the dimples less visible. But do not expect any dramatic results. Long needles (at the very least 1 mm) are required. Apply cellulite cream regularly, preferably one containing caffeine and roll it in with a 0.5 mm roller (the skin where cellulite usually appears is thick so 0.5 mm for product penetration is appropriate there even though 0.2 mm will do as well. Massage the cellulite skin with a mixture of salt and oil to increase circulation. Massage the area with a plunger to cause a suction effect. Not vigorously, just mild suction will do. I can explain later why a plunger may help with cellulite. This suction method should not be used when you are prone to broken capillaries. Exercise to keep the muscles toned. Regarding your tummy tuck scar: You should wait until the scar is healed/remodeled. The scar remodeling takes a long time (it can take one year). I am sure your surgeon will advice the best scar healing management. Remodeling means that the appearance of the scar is still changing and improving. If your scar is raised, your doctor will likely recommend you a pressure massage done with the fingers. 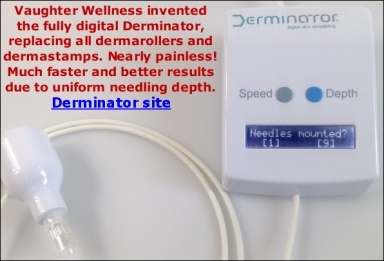 When your scar is fully healed and remodeled and you are not happy with the way it looks, use the single needle method explained in our dermarolling instructions. That scar will never disappear - you can only improve its appearance. Also read my article on treating cellulite. > 1.5mm and NOT the narrow line 1.5mm ? I believe the regular 1.5 mm would be best, especially if you have a lot of stretch marks. When you become proficient in dermarolling, and if you find out that 1.5 mm causes absolutely no occasional pinpoint bleeding, you can even opt for 2 mm long needles with your next purchase but such long needles should be only used on the areas with thick skin. If your 1.5 mm roller does cause occasional pinpoint bleeding, then stick with that one, no need for longer and more painful needles. >How long does each kit last? It depends how often you roll, how tough your skin is and how big the rolled areas are. You can soften your skin before dermarolling by taking a hot bath or long shower. It will make the skin easier to penetrate for the needles. It should make the rolling easier for you and it will make the needles remain sharp longer. >When should the dermarollers be replaced and how do I dispose of them? It should be replaced when the needles do not penetrate the skin as easy they used to. Simply, when it has become blunt. Keep in mind that the skin is a very tough organ (it has to be because it is a protective barrier) and it is in fact very difficult to penetrate the skin even with sharp needles. Skin toughness and thickness varies - depending where on the body it is. Try to roll the soles of your feet, you will likely not manage..
A good way to dispose of a dermaroller is to wrap tape around the needles and throw it away in the ordinary garbage. A dermaroller contains only plastic and a little bit of steel. > help me along my journey to rid my stretch marks? I wish I could recommend you a miraculous cream that provenly and significantly helps with stretch marks but I do not know of any. Try to apply creams indicated for striae (stretchmarks) and roll them in up to 3 times a week with a dermaroller intended for skin product penetration enhancement (0.25 or 0.5). No guarantee it will help though. You should supply your skin with vit. C and A because they are needed for collagen production. Copper peptides may be worth trying but I do not have experience with them neither I received sufficient feedback from our customers to guarantee you they will help. The only available research on Copper peptides has been done by the same people that patented them and are selling them. We wrote a little about that research, but it is certainly not sure that they will make a big difference. We gave them the benefit of the doubt, based on the little data available. Also unfortunately there is currently no way to completely get rid of stretch marks (unless they are very shallow and that is usually not the case). However you can greatly improve their texture, color and even their depth and thus make them much less visible. It is a long journey and a lot of patience is needed. The best improvement of stretch marks so far achieved by our customers was to manually needle them with the single needle that is a part of our dermaroller kit. It is laborious and you have to do it several times before you will see results but it is worth trying. A single needle will crush the hardened collagen bundles and that will soften the striae and improve their taint and texture. It will trigger new collage production and that can make the scar slightly less indented after repeated needling. You might be lucky and achieve melanocyte production - which means your stretchmarks will start to tan or partially tan. Whatever the skin problem is, the best option is to have one roller with short needles for skin care product penetration enhancement and one roller with long needles (reaching the dermis) to trigger collagen production. If you are a dermarolling beginner, do not buy a 2 mm roller because it is suited for people who already know how thick their skin is and who are familiar with rolling. You misunderstood me about the rolling frequency of a 0.25 roller. It is not once every three weeks but it is 3 times a week. It depends on you how frequently you want to roll for product penetration but a 0.25 mm roller can be used three or four times a week anywhere on your body except the upper eyelids. The single needles in the kit are all the same size. Needling the same spot of skin with a single needle is done once a month. You can use a single needle every day but the same scar or stretch mark or spot etc should not be needled more than once a month. The same with a long-needled dermaroller (1 mm and above). You can use it every day but not on the same part of the skin. You can for example single-needle every day several of your stretch marks or acne scars (every day different ones) if you find time for it. We have a limited supply of 2.0 mm dermarollers in stock now, because a few people have asked for those. It is suitable for use on very thick skin, deep acne scars, deep stretchmarks, wrinkles and sagging skin on the body. Not to be used on the neck. Can be used once every six weeks. Acne scars and stretch marks need long needles because they are usually deep in the dermis so you should opt for 1.5 mm. You can certainly use the single needle on your scars and stretch marks. Concerning the pinkish spots (those are likely not deep) you should first use a dermaroller on them. If a dermaroller doesn't improve them, do a test patch with a single needle - make several pricks into one of your spots and you'll see what happens. It will get red and it will likely look worse for some time (more visible) before it fully heals. We advise to use a dermaroller first to stimulate the whole area and then target only the scars, stretch marks or other specific skin problems with the single needle. It is for sale in drug stores or beauty shops etc. But any brush will do as long as it is not too rough and harsh. removed that advice because the most suitable best skin brushes have a wooden handle and they can be used as long as you clean them after use and keep them dry. You mean Mederma in general or directly after dermarolling? You can use any skin care product of your choice. The best would be to buy two dermarollers. One with short needles (0.20 or 0.25) for skin care product penetration enhancement that can be used up to 3 times a week. You apply Mederma for example and roll it in. For skin product penetration, some people prefer to use 0.20 or 0.25 for their face and chest and 0.5 mm for areas like buttocks, hips, thighs or the back because the skin is thicker there. It is not necessary to use a 0.5 because even shorter needles will fully penetrate the stratum corneum and enable the product go deep into the skin. Also, buy a roller with long needles that reach the dermis for collagen production and that can be used once a month on the same area.